A longline a type of fishing gear that is generally used to target pelagic species, such as large tuna and billfish. Baited hooks are attached to a long fishing line via shorter branch lines called snoods or gangions. Longlines can be anchored or freely adrift (with tracking devices so they can be retrieved). In certain open ocean fisheries, these lines can be miles long and hold thousands of hooks. They can be located at the surface or deeper in the water column. Due to the nature of the gear, longlines are often subject to bycatch of unintended species. Management strategies to reduce incidental take of sharks, birds, turtles and other species include setting the lines quickly, at deeper depths, and at night. Sound deterrents can also help ward off seabirds. Trap net (image credit: Michigan Sea Grant). 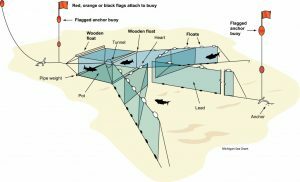 A trap or pound net is a type of fishing gear with a complex organization of nets anchored to the substrate that “lead” or funnel fish into a final compartment (i.e., trap or pound) from which they cannot escape. In the Laurentian Great Lakes, this type of fishing gear is called a trap net and in marine and estuarine systems, it is generally called a pound net. A fyke (pronounced similar to “like”) is specific kind of trap net that uses a series of cone-shaped bags; it is typically a smaller size. Fish harvested from this type of gear are often considered higher quality than those harvested from gill nets because fish can swim freely in the trap/ pound until the fishermen come to haul the nets. Certain types of bycatch can also be more readily released unharmed from this gear than others. For an example of how this fishing gear is used, please visit “Know Your Nets” from Michigan Sea Grant.